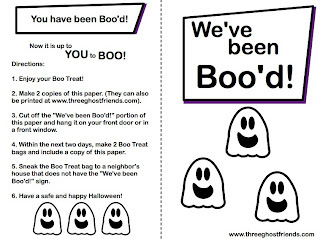 Three Ghost Friends: Have you Boo'd your neighbors, yet? Have you Boo'd your neighbors, yet? My kids love "boo-ing" their neighbors! Have you heard of this tradition? Your family makes up two treat bags, sneaks them onto your neighbors' porches, and then they are instructed to "boo" two more houses. The preparation, the sneaking, and then watching the BOO'd houses multiply in your neighborhood is so much fun for the kids! Sound like fun? Now, all you need is a little Halloween spirit and the printable below!